Synopsis: Avery Hood is reeling from the loss of her parents--and the fact that she can't remember what happened to them even though she was there. Thoughts: This book is a very quick read. I whipped through it fast. That being said, I probably whipped through it because I really enjoyed it. On goodreads this story is getting mixed reviews... people either seem to love it or hate it and well, I'm on the love it side. We start with Avery (beautiful name by the way!) who's parents are murdered. The only thing she can remember is being covered in blood, them broken, and seeing silver. Avery is sent to live with Renee, her grandmother and being as strong as Avery is, she continues her daily routine. When she meets the new boy Ben she starts to realize her feelings for him are deeper than she ever imagined could be. But can Ben help her figure out what happened to her parents, or worse does he know what happened? I really enjoyed Low Red Moon. Avery, I thought was an extremely strong character. What she endured and still continued on to help avenge her parent's murders... was such a strong trait. Then there's Ben. Handsome, "I'll always protect you", Ben. Part of me wishes Avery & Ben we're friends for a bit first, then the other part me says you know what 'if you know, you know', and believe me these two know! Their love is so compelling and so rich. There weren't too many characters in this book that played a huge role. Though, I did like Louis (Ben's uncle). I'm very curious to see where Ivy Devlin will take us with Ben, Avery, Louis, and Renee in the *I hope it comes out* sequel. The paranormal in this book is obviously Warewolves, and you know what it has it's own spin on it and I really liked it. You don't dig too much into it, but if a sequel is made... I would love to dive in deeper to it. Another thing about "Low Red Moon" for me is the title... I honestly am not sure why it's the title. 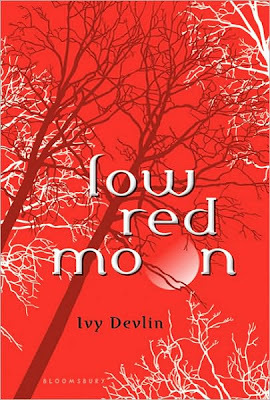 I know 'low red moon' is mentioned in one of the chapters, and the color RED defiantly fits, but i'm not sure where low moon came from. It should have been something more like Evil Silver Flash! (Hahaha or something). I do have to say I really enjoyed this and hope that the unanswered questions will show up in a sequel.